2018 is the year that is taking the curb appeal of your home to the next level. Homeowners are more aware now than ever before that how their homes look on the outside has everything to do with how the inside is viewed. This is even more important when looking to put your home on the market. The exterior of your home is a reflection to the rest of the world of you. It can make your home look warm and inviting or just the opposite based solely on how it looks. One way that homeowners are looking into bringing new life to their homes exterior is through the installation of new vinyl siding. Vinyl siding installation creates an entirely new look for your home. It is important to choose a color that expresses who you are while also taking into account other homes within the neighborhood and future buyers preferences. In some areas vibrant colored vinyl siding is the norm however for many of us safer choices such as shades of gray or beige are more suitable. To really determine what color is best for your homes new vinyl siding homeowners should consider the advice of an outside source, such as the siding contractor. Professionals will offer you the cold, hard truth about your choice in the color choice of your vinyl siding. 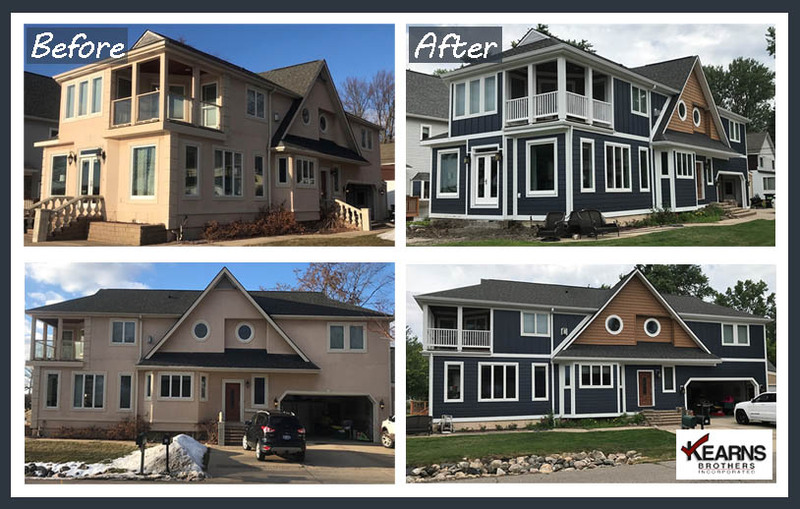 Often times exterior siding contractors work with professional decorators to come up with a plan for exterior home renovations to be sure that all plans for the exterior of the home are tied together. One aspect that contractors and decorators will consider is the color of the exterior doors of the home including the garage door as well as the color of the roof. If you as a homeowner are not looking to replace the entry and garage doors or to install a new roof, then it is crucial that the homes vinyl siding is compatible with them. The homes siding should also compliment the architecture of the home. Certain styles of architecture fit better with certain colors and not with others. 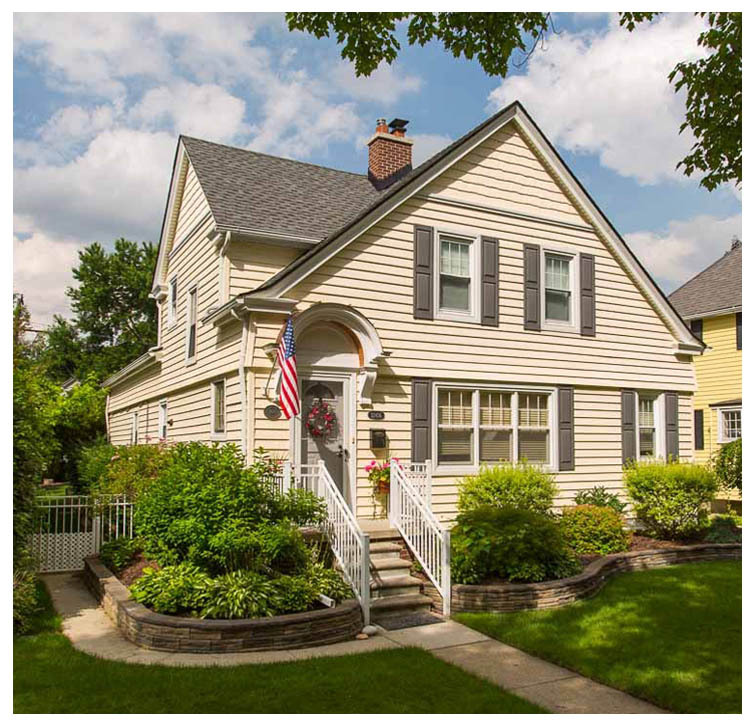 Think about the typical colonial home; what comes to mind? Yep, solid color vinyl siding in yellow, white, green, or blues. Another feature to take into account is the size of your home. Super dark vinyl siding makes homes stand out. Dark colors can be considered overwhelming when used on larger homes where as on smaller homes they can create a cozy feeling. If you are looking for your home to blend into the homes around the neighborhood then it is best to stick with lighter vinyl siding colors such as white or yellow. Consider the climate in which your home is as well. There are particular colors that are perfect for homes in cooler climates however look off when used in tropical climates. Sunlight exaggerates brighter colored vinyl siding while heating up dark color siding. It is also crucial to consider color combinations as well. Dark blue and black appear dark and drab whereas dark blue with white trim appears nautical and fresh. The external structure of your home and its surrounding environs say a lot about you as a homeowner. You may not necessarily have a perfectly manicured lawn or a healthy rose garden, but with a few money-saving ideas, you can improve the exterior of your home and its curb appeal. For example, if you like flowering beds, consider planting flowers and shrubs that fit a minimum maintenance level. Ground cover plants that are that is self-propagating such as ferns and ivy grow easily, and all you have to do is keep it trimmed. Consider also renting a power washer to remove stains, dirt, and debris from your sidewalk, driveway, and patio to ensure your grounds in entirety look well-maintained and neat. The exterior of your home is your first line of defense, and unfortunately, through no fault of your own, it is quite susceptible to the harsh elements. When siding begins to age, it fades to a dull and very unattractive color that becomes an eyesore. Fortunately, you can repaint or replace them with new siding that comes in a variety of colors, profiles, and textures. The goal is to find professional siding contractors who are more than willing to take the exterior of your home to a whole new level of elegance. Another addition to consider to your siding project is window replacement, but if the budget doesn’t allow, you can still achieve a wow factor for your buck with a lick of paint on your shutters, doors, and gutters too. If you must paint, always use neutral paint colors on your walls to give potential buyers a fresh canvas to work with. Remove all worn-out or dated wallpaper because not only does painting over old wallpaper a turn-off, but it also makes the removal process challenging. Replace scuffed or stained carpets and spend a little more on a new floor, preferably hardwood floors because they are trending and very easy to maintain. Paying close attention to things like the heating, drainage, drafty windows, or simply swapping the shower curtain for a glass shower door goes a long way. Consider buying new lighting fixtures, faucets, and handles, and have the tiled areas of the house such as the kitchen, bathroom, and floors professionally cleaned or re-grouted. Have you taken a look at the siding on your home recently? Over time it can breakdown and begin to look unsightly. Since it is a gradual process you may not notice until it’s too late. A house’s siding has been designed to protect the interior structure from the harsh elements. Is it time for it to be upgraded? Check your siding for one of the following five signs. Is your house’s siding falling off at an alarming rate? Do you constantly have to hire a handyman to go onto the ladder to reset it in place? Perhaps you’ve had to buy new siding from the store and patch it up. Now it looks uneven, but you’re uncertain whether it’s worth painting. It may be time to do some exterior home improvements. Is there excessive dampness within the home? If your home is starting to feel damp inside and you can’t seem to get it warm enough, your siding may be failing. This can be causing dampness and moisture to get into the structure of your home. Over time, this can cause major problems, such as issues with the development of mold that can infest your entire home. And while you’re having your siding done, you may want to do some replacement windows too, that can help provide energy bill savings. Are little critters finding their way into your home? If your siding is falling apart, this can be an opening for little critters to get in. They love the warmth of a home. You may start seeing a lot more insects too. There may be cracks and gaps starting in your siding. It’s time to withdraw the invitation and get the siding contractors to install fresh new siding and do other exterior home improvements too. Does your siding look like it is fighting the wind? Even if the siding hasn’t completely fallen off yet, it may be loose. If you ever hear any exterior noise during a wind storm, it may be the siding banging against your house. It’s only a matter of time before it comes off, which can be a safety hazard for people walking past. This is a sign that you need to call the experts to do exterior home improvements. Are you uncertain if your siding confirms to fire regulations? When was the last time the siding contractors came by and fully replaced your siding? If you’re the new owner of a house, you may have no idea when it was last done. Did you know that siding contractors use fireproof and flame-retardant siding now? Not only will your home look brand-new if you hire siding contractors to tear off your old siding and install with new, but you’ll also be conforming to industry regulations that will keep your family safe. You may experience many other signs that it’s time to upgrade your siding. This may also be the perfect time to get replacement windows or have the roof done too. Soon your home will look brand new, for only a fraction of the cost of buying a new house!